SHOP NOW OPEN Ho Ho Ho! 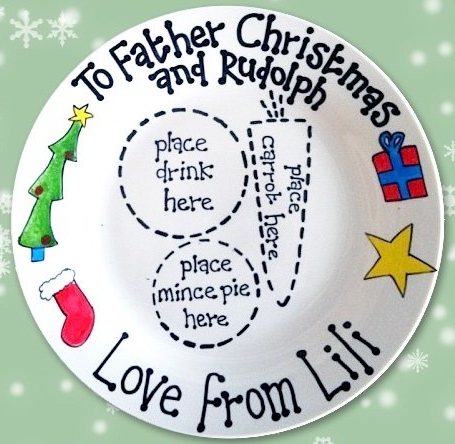 These cute personalised Christmas eve plates are available for “Santa” or “Father Christmas” and are hand painted and have places for the mince pie, drink and carrot for Rudolph. Make your child’s Christmas even more magical with a personalised plate for Santa’s treats. If you would like something else eg “cookie” instead of mince pie just let me know. Facebook page: here 12,500 Facebook fans can’t be wrong! Please give it a “like” to help us spread the word! POSTAGE IS INCLUDED IN THE PRICES QUOTED, MANY THANKS!